This Kooky candy bar was an impulse buy at the checkout line of my parents’ neighborhood grocery store, HEB. It’s a knockoff Twix that was shelved with a knockoff Snickers, 3Musketeers, and Milky Way, but I chose to buy the Kooky because it was on sale (3 for $1 instead of 2 for $1). The Kooky called itself “biscuit and caramel covered with milk chocolate” with the tagline “That’s the way the Kooky crumbles” (groan). Like a Twix, there were two fingers per package. The caramel with stiff and a little chewy. It tasted sweet with scorchy butter notes. I found it quite enjoyable, especially for a mass-market bar. I also liked the biscuit layer. The cookie was dry and crumbling with some nice toasted notes that gave it some complexity. Finally, the sweet milk chocolate coating was fairly standard. I had just the slightest tinge of a sour burn in my throat after I polished off one of the fingers, but I didn’t feel like it was too sweet since it was balanced out by the cookie. 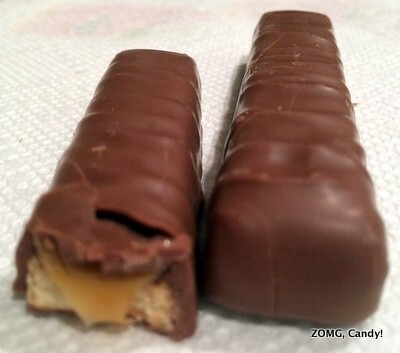 I didn’t have a Twix to do a side-by-side comparison on this treat, but I think I actually would prefer the Kooky – I really enjoyed the darker flavor tinges that the toasted cookie and caramel brought. An OM.